Disc golf is an ultra-fun sport that anyone can learn. Simply put, if you ever enjoyed throwing the Frisbee around with friends, multiply that fun by 100 and you’ll understand the enjoyment that can be had through a lazy, yet competitive day of disc golf. Typically, disc golf is played in parks that are set up for disc golf play. 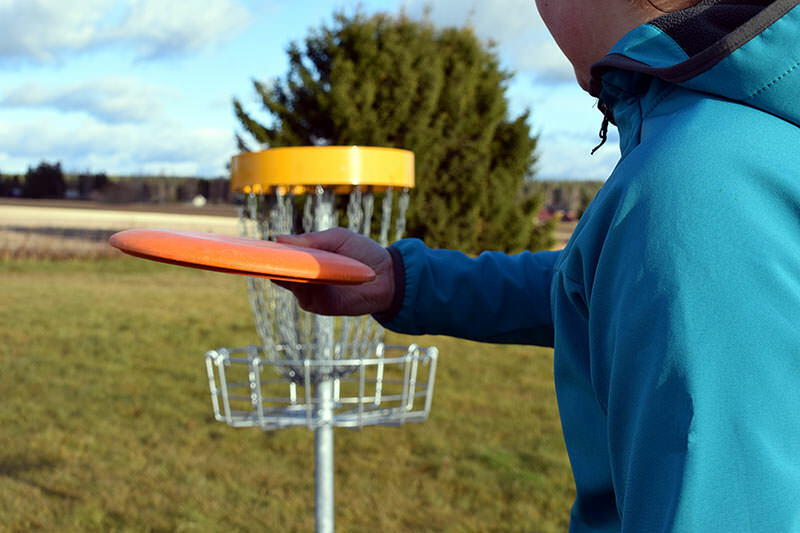 These disc golf courses usually have between 9-18 “holes,” except instead of aiming for actual holes like in standard golf, players aim for disc golf baskets that are interspersed throughout the course. It’s a lot of fun, but not everybody can find the time or the energy to play an entire course. That’s why these portable disc golf baskets are so cool, allowing people to practice or even set up their own shortened disc golf course right in their backyard. To help you understand disc golf baskets a little more, below we have reviewed several of the most popular and best-selling baskets on the market today, and highlighted the pros and cons associated with each product. 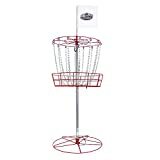 We have also included a Disc Golf Basket Buyers Guide, in which we will point out the various things to look for when it’s time to shop for your own disc golf baskets. One of the most coveted disc golf practice targets on the market today, the Innova DISCatcher Traveler Target is a must-have for those who are serious about their disc golf game. As the name suggests, the target is ideal for those who plan to travel with their basket for the purpose of games and practice. The target is perfect for camping trips to the mountains and excursions to parks, beaches, or anywhere else you can play. The lightweight makeup of this basket makes it easy to carry, setup and take down, making it ideal for schools and summer camps. The target is ready to use out of the box with just a few minutes of easy assembly. Weighing a mere 15 pounds in total, the Innova DISCatcher Traveler Target is collapsible and is easily the most portable option on our list. The basket comes in a variety of vivid colors, including red, blue and yellow, and the matching carry bag is a very nice bonus. Lightweight. At only 15 pounds, the collapsible and compact Innova DISCatcher Traveler Target is extremely lightweight and portable. Well-constructed. The well-constructed target can stand up to hours of punishment from discs. Budget-friendly. One of the most budget-friendly products on our list, the Innova DISCatcher Traveler Target is a great deal for anyone watching their pennies. Top can twist. Some reviewers have complained that the top of the Innova DISCatcher Traveler Target can turn and get twisted when the target gets hit. Carry bag not durable. The carry bag can rip and tear if all the parts are not properly collapsed. For a disc golf basket that mirrors those you’ll find on your favorite course, go with the MVP Black Hole Pro 24-Chain Portable Disc Golf Basket Target. The target boasts 24 highly visible zinc-coated chains that are very course and durable. The 12 outer and 12 inner chains are spaced equidistantly to guarantee no weak pockets in the target, thus reducing cut throughs and pole bounces. The MVP Black Hole Pro 24-Chain Portable Disc Golf Basket Target is PDGA improved and built to standard PDGA height and size regulation. The all metal construction and uniquely engineered design makes the target very sturdy and durable, and it can usually be assembled or disassembled in under a minute. Durable. The all-metal construction and tough target chains make the MVP Black Hole Pro 24-Chain Portable Disc Golf Basket Target nearly indestructible. Easy to assemble. The MVP disc golf basket can be assembled easily, often in just a minute. Realistic. PDGA approved and regulation sized, the MVP Black Hole Pro 24-Chain Portable Disc Golf Basket Target is very genuine. Heavy. The all-metal construction of this disc golf basket may hinder its portability. Poor visibility. 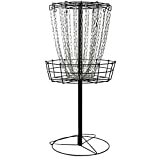 According to some reviewers, the visibility could be better on the MVP Black Hole Pro 24-Chain Portable Disc Golf Basket Target. With its three quick-release pins, the ROPODA Pacific Outdoors Disc Golf Goal is very easy to setup and disassemble for easy storage. 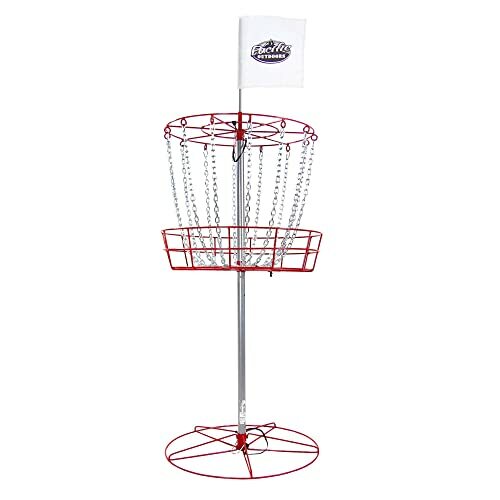 Its adjustable height can accommodate players of all ages and sizes; and the compact, portable design makes traveling a breeze with this disc golf basket. The ROPODA Pacific Outdoors Disc Golf Goal is constructed using galvanized and powder-coated steel, which will help the target resist moisture and oxidation. Included with this goal are three regulation discs—one for putting, one for approach and midrange shots, and a long range disc that really flies. Durable metal construction. The galvanized and powder coated steel construction of the ROPODA Pacific Outdoors Disc Golf Goal makes it very durable and long lasting. Comes with three discs. 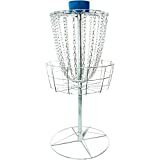 The disc golf basket comes with three practice discs designed for different length shots. Easy setup. The three-pin design makes for simple setup and disassembly. Only one set of chains. Equipped with only one set of chains, the goal does not mirror regulation targets. No anchors. Having no anchors, the ROPODA Pacific Outdoors Disc Golf Goal may tend to be wobbly on some surfaces. As you can see from the reviews above, there is no shortage of these portable disc golf baskets on the market. But how do you know which product is right for you? This will depend on a number of factors and characteristics related to the basket in question. To help you make the ideal selection for your needs and preferences, below we have discussed some of these factors and considerations, which collectively will enable you to make the most informed and educated buying decision. 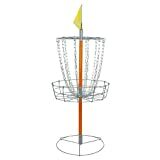 Balance is an important concern when buying any disc golf basket. 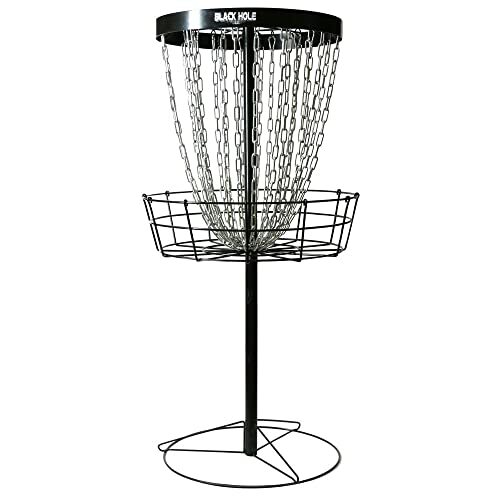 The ideal disc golf basket is one that will stand on its own without having to be supported by any ropes or objects. A well-balanced disc golf basket should be able to stand easily on pavement, grass, and even sand—if you plan to play at the beach. Make sure you test out several disc baskets until you find one that passes the balance test. The size of the disc golf basket is another important consideration. If you are tall—or if you plan to play with taller people—you will need a basket that stands at the proper height and has just enough width to make it both challenging and accessible. Many of the disc baskets today are fully adjustable. These are definitely the type we recommend. Adjustable disc golf baskets will allow you to change the height to match the size and skill level of the player. 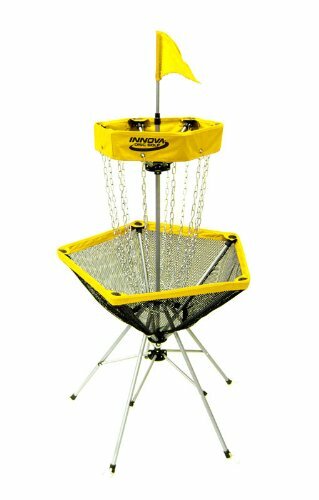 Just how portable do you want your disc golf basket to be? 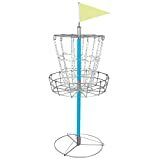 Disc golf baskets or targets come in a wide range of weights. Some baskets are designed to brought with you wherever you want to play, and can be broken down so as to fit in a standard backpack. There are others that are on the larger side, making them tricky to carry for any great distance. If you plan to set up a course in your backyard, and will only need to move them a few feet from time to time, we recommend the larger size targets. However, if you are going to take your disc golf target on the road, you should probably look for one that is a little lighter and much more portable. Disc golf targets can be made from many different materials. Goals that are entirely constructed from metal tend to be heavier and bulkier. The upside is that they also tend to be more stable and resilient to the force of Frisbees or disc colliding into them. Hybrid goals are always a good idea. Hybrid goals are constructed of mixed materials, such as lightweight metals and mesh fabrics. These goals tend to be lighter and easier to move from one location to the next. However, they generally are not as durable and long lasting as the all-metal goals and they are not resistant to all weather conditions. 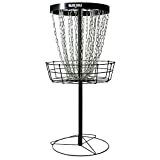 When choosing a disc golf basket material, you will first need to decide how and where you are going to use the goals, and then select a material or materials that best suit that purpose. A portable disc golf basket should look and feel just like the real thing. This is important, as you want your practice sessions with your new target to translate to the real course. Many of the disc golf baskets that are available for individual purchase today have the same dimensions of a genuine disc target, and they meet all the PDGA standards. Others, sadly, are nowhere close to the proper measurements. Another aspect that will influence how closely it resembles a regulation goal is the number of chains a portable disc golf basket has. Regulation goals have 24 chains—12 chains on the outside, six in the middle, and six inside. These chains, setup in this pattern, are what keep the discs from shooting through them. The weight of the chains is also important for obvious reasons. Lighter chains will allow the disc into the goal, while heavier chains may cause it to bounce out and hit the ground. Some people may want to intentionally purchase a disc golf basket with dimensions that are narrower than the real thing. This will allow them to practice their aim on a less forgiving target, thereby improving their accuracy and preparing them for the real thing.